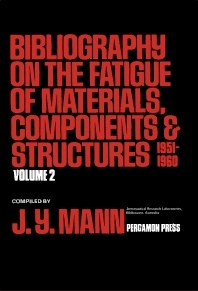 Bibliography on the Fatigue of Materials, Components and Structures, Volume 2 is a list of references on the above subject spanning the years 1951-1960. The list of references is arranged chronologically according to the book's or paper's publication year. The Bibliography then lists the surname of the first author alphabetically in the respective year. When a paper gives no authors, it is listed at the end of the alphabetical listing of that year, in order of the publication date. The Bibliography also provides a subject and author index. The description that the volume uses is based on the titles of the paper or book. The text also lists the title in the original language of the paper, followed by an English translation. The volume contains more than 1,000 published materials from 30 countries. The topics these references cover are on the fundamental research made in the fatigue of materials; the determination of fatigue properties; the utilization of a different manufacturing methods; the various formulations to overcome occurrence of problems; and the development of design techniques. The style of numbering followed in this volume is a continuation of the numbering system used in Volume 1. The Bibliography can be used by physicists, scientists, and materials engineers to gain access to a wide variety of books, papers, and research on the above subject.